Arbor Crest Wine Cellars is proud to offer over a dozen handcrafted, award-winning reds, with selections that include both "everyday" quality and value, along with distinctive crown jewels from our Premium Collection of family labels, featuring varietals from our Avansino, Farrington and van Loben Sels Cellars brands. • our satellite location inside the historic Davenport Hotel, in the heart of downtown Spokane’s Cork District. Go BIG with your wines! MAGNUMS. One and a half liters of wonderful Arbor Crest wine, double the standard bottle. Their size makes a big impression as a gift or party conversation piece, and they also age exceptionally well due to slower oxidation in the larger bottle. Arbor Crest Cabernet Franc, Arbor Crest Dionysus, or Farrington Malbec (signed by Arbor Crest winemaker Chris Farrington). Available at both locations ($85/btl, Cab Franc and Malbec; $100/btl for the Dionysus). Quantities are very limited, get yours today! To have wines shipped directly to your front door, please see details on our Order Wine page. Our Cabernet Franc from the Columbia Valley is a delicious example of the traditional Bordeaux varietal. This wine is a sumptuous blend made from grapes grown in the prestigious Conner Lee Vineyard. This wine integrates a spicy herbalness with bright red fruit and jammy characters that unfold and linger on the palate. The elegance of this full-bodied wine weaves layer after layer of spicy oak, red currant, cedar and black raspberry flavors. Barrel-aged in French oak for 20 months, this wine will age gracefully for another 6 to 8 years. 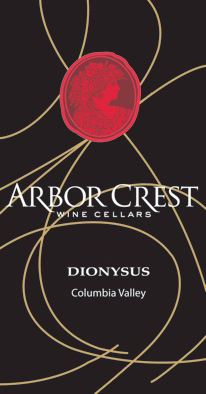 This complex and full-bodied Cabernet Sauvignon is a delicious blend from the Dionysus, Bacchus, Kilpsun, Stillwater Creek and Wahluke Slope Vineyards in the Columbia Valley. The multiple layers of chocolate, red current and plum explode on the palate, finishing with hints of spices and herbs from the French oak. Barrel-aged for 20 months, this wine displays intense dark berry fruit and a full-bodied character that Cabernet lovers cherish. This special blend of Cabernet Sauvignon was created by our winemaker, Kristina Mielke-van Loben Sels, in honor of her parents, Arbor Crest founders Harold and Marcia Mielke, and their beloved 1931 Cadillac V16 Phaeton. Designed by the legendary Harley Earl, it was one of only 364 cars produced in 1931; only a dozen or so of this model remain today. Raise a glass of Cadillac Red, and join us in a toast of appreciation to parents everywhere, for giving us the drive to pursue our dreams! The Arbor Crest family is pleased to present Cliff House Red, our special proprietary blend, created in honor of the Cliff House, the historic and beautiful Florentine-style mansion on our estate. This sumptuous wine is made exclusively with the finest Columbia Valley red grapes. The bright fruit and jammy characters that unfold and linger on the palate are a fine example of the excellent fruit from this appellation. This medium-bodied wine displays layers of spicy oak, red currant, cedar and black raspberry flavors. One of our most highly acclaimed wines, Dionysus is a masterful blend of Cabernet Sauvignon, Merlot, Cabernet Franc, Malbec and Petit Verdot. This distinctive blend was given the name “Dionysus” to highlight its origin from the exceptional vineyard of the same name, and to acknowledge the mythological Greek god of wine. The creation of Dionysus is where art presides over science, displayed through the rewarding winecraft of blending. Aged in French oak for 24 months, this full-bodied wine offers alluring aromas of maple sugar, cedar and black raspberry unfolding on the palate as plum, nutmeg and black cherry — thoroughly seductive. Dionysus will age gracefully for 10-12 years. Our 2014 Columbia Valley Merlot is an excellent example of a full-bodied Washington Merlot. Ripe and concentrated, this wine strings layers of intense raspberry, complex currant and blueberry notes framed by spicy, vanilla-scented oak. Barrel aged in French oak for twenty months, this elegant wine finishes boldly with intense cherry, blackberry and plum flavors lingering nicely on the palate. The vines are grown on original, ungrafted rootstock, which provides the grapes their intense varietal character. This wine embodies a tradition of red wine excellence, ensuring a memorable tasting experience. Our wonderful example of a Washington Sangiovese displays a nose of ripe strawberry jam with spicy notes unfolding on the palate as clove and currant. This well established vineyard, situated in a warm and arid climate with a unique soil profile, consistently yields these wonderful, jammy characters and hints of smoke and cassis. Arbor Crest’s Syrah is an exciting wine that is full-bodied as well as rich and velvety. The grapes were hand-picked and hand-sorted with yields kept low, producing a wine with concentrated black cherry and blueberry nuances. Balanced by a fine acidity and tannin structure, the toasty spices from new French oak add hints of nutmeg, clove and licorice. To see a complete Wine List with pricing and shipping information, please visit our Order Wine page.